Today I’m going to start a good new tradition on MGwebmaster.com. I’m going to interview different interesting people somehow related to the online business who can share beneficial and truly insider information that sheds light on how to actually run a business on the web. 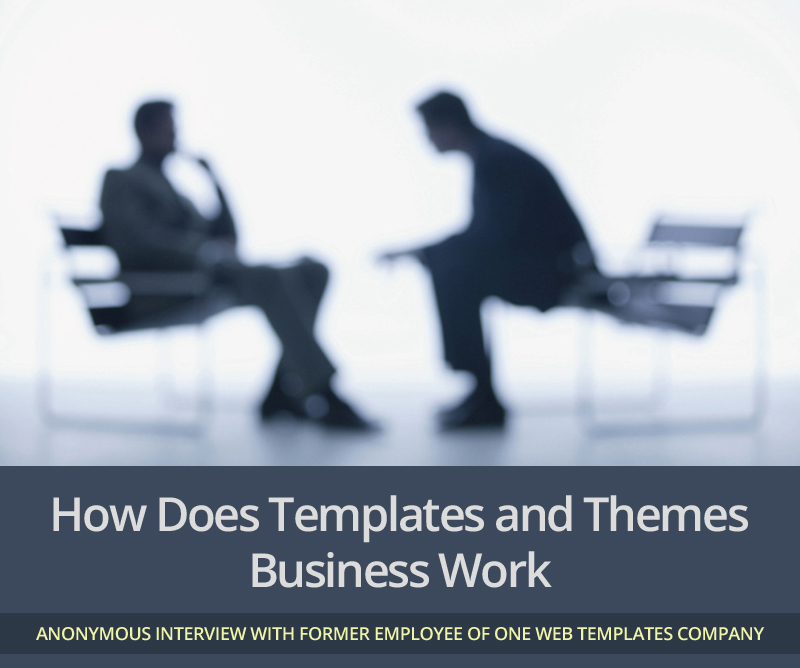 So, today I will publish an interview with a former employee of a well-known company manufacturing and selling website templates and themes. At the request of this person, the interview is anonymous since it was one of the conditions under which you can read this material. Question: Hi, I know that manufacturing and selling website templates is not new but a rather profitable online business. How is it going in this industry? What has changed over the last year or two? Answer: Hello. Yes, it’s an established business and I was at its origins as a regular web designer. Today, the situation has become different. Not so difficult, as many say, but just different. Everything is changing and this business also changed. Over the past several years, sales of HTML templates have dropped significantly. People buy WordPress themes and eCommerce templates with already integrated CMS. Now the client doesn’t want to buy a raw CSS template and customize it after the purchase. Why? If one can buy a 100% ready-to-use website at Themeforest.net. Many people do so and this is one of the reasons why sales dropped. Q: But Themeforest.net exists for a long time, why only now it managed to gain a portion of sales? A: It affected the entire niche previously. Companies such as the one I used to work for manufactured web templates on their own. For this purpose there were departments of web designers, programmers, graphic designers, coders and everything worked as one mechanism. Themeforest.net works completely differently. The freelancers and regular web development teams manufacture high quality products and put them at Themeforest.net for sale. Do you see the difference? It is motivation … People who work for a salary, even for a very high one will never put as much effort as those who are self-employed. In this case, people can see that they can earn a lot of money if their product is really good. When there are many such teams, their motivation and competition lead to serious results. Quality is what distinguishes the themes at Themeforest.net from others, which is, frankly speaking, hard to compete with. Q: But I remember those days when Themeforest.net sold different rubbish to novice webmasters for pennies. Why major template developers don’t put their great web designers to work? The issue of money or they cannot be interested in such work? A: We don’t have professional wed designers, meaning, those who work in companies for a salary. Yes, the companies have to pay them a very large sum of money, but I think it is not even about money. These guys are working on their own for quite a long time. They put their work at Themeforest.net and earn millions. I know it sounds loud, but believe me, it is true. Q: WOW… I understand, what do your top managers think about this situation? How do your competitors solve the problem? A: Today, in the companies as the one in which I worked, most often the whole work is outsourced to Ukraine, India, and Pakistan. Entire departments work in these countries and it allows them to save а significant amount of money, which in turn helps to reduce the cost of products and thus increases their competitiveness. Q: Stop. Are you trying to say that in the US it is only an empty office, fax and phone? A: Of course not. But the main divisions responsible for the production of web templates are not entirely in the US. This is a classic outsourcing and it has been so for a long time. It allows the companies to considerably optimize their expenses. Reducing the cost of templates slightly helps to remedy the situation, but not significantly. I know that our main competitors are trying to sell their best products at Themeforest.net. There is another category of customers who don’t want to buy anything from the freelancers even if they are triple-premium members at Themeforest.net. This category of clients is interested in purchasing from large companies that offer guarantees and technical support, the ones that can offer a lot more in addition to the themes, varying from free images to web hosting. This is what they are ready to pay for. But those are rather old-fashioned people and there are not many of them. Q: Ok. It is all clear. Could you explain who the system works? 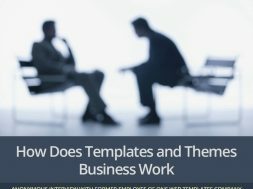 How does the production of templates and themes looks like today? A: As I said, the offices with developers are located in Eastern Europe and Asia. There are production departments, the main of which is a division of web designers. These are the elite – those who set the tone for the entire process of developing templates. Web designers are coming up with a layout design idea, structure, and choice of colors. Typically, web designers create the design only for a Home page; the other subpages are made by other designers who specialize only in developing subpages. Typically, these are the beginner web designers who are not yet experienced enough to develop template designs on their own, but are quite capable of designing subpages. When design of all pages is completed they are given to the department of programmers and coders. After that, the template is ready for sale. It is worth saying that there is a quality control at each stage of development, from the initial layout design inspection to testing and final delivery of the finished template. Q: What can you say about marketing? How to get customers? A: A variety of different ways: PPC, SEO, and SMM. In addition, we use the banner ads – it also works well. Q: How do you track the effectiveness of banner advertising? Do you use any specific platform? A: Yes, we use BuySellAds, but in addition we have our own software that tracks both clicks and leads. Q: At the end of our conversation, what can you recommend to those who make money in this business? A: Firstly, the most important thing is to understand that the quality is no longer enough. It is not enough just to develop high quality templates or themes and hope that the customers will notice your product. Place your bet on the service. Offer the service varying from helping the client to select a template to its final customization and uploading to a server. The better and faster you will be able to provide all of this, the more customers will return to you again and will also bring new customers – their friends. Currently, many large companies, including the hosting providers are simply unable to offer good service. They often have a really high quality product, but the inability to collaborate with their customers and quickly resolve their issues lead to an outflow of customers. This common problem is actually inherent in many large companies. Secondly, I would recommend developing and selling templates in one particular niche, not all of them. Take a narrow specialization and work only in its direction; in fact, this is a more winning strategy. Today, there is a huge competition in this business and it is impossible to be good in all niches/CMS. Furthermore, in the future, you will save significant amount of money on marketing. Promoting one niche, for example, eCommerce Magento Templates is much easier compared to the project selling a variety of templates and themes.